We've caught various tidbits pertaining to a Samsung Galaxy Prime (2016) before now. 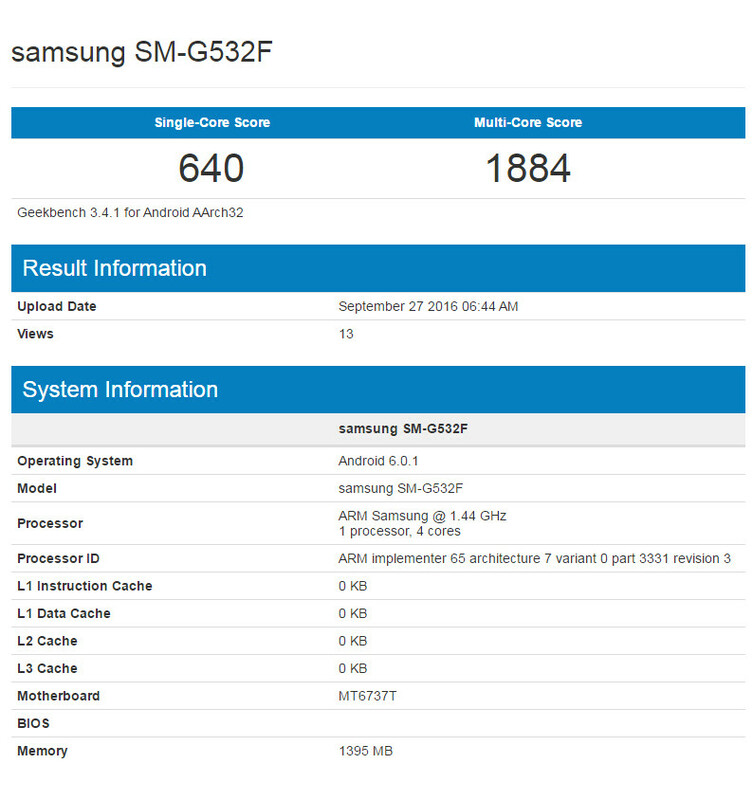 Back in August, the 5-inch handset was spotted on Geekbench to reveal a quad-core CPU and a relatively modest 1.5 GB of RAM. The device then gained Wi-Fi certification earlier this month. Now, the device has been spotted on Geekbench once more, and with FCC certification also adding a touch of authenticity, we expect an official announcement to be just around the corner. What do these new insights tell us? Unfortunately, not a lot that we didn't already know. The FCC confirms that alongside the standard Galaxy Grand Prime with the model name SM-G532F, there will be a further SM-G532F/DS with two SIM slots. Geekbench confirms the four-core MediaTek MT6737T chipset with a maximum 1.4 GHz processor clock speed along with 1.5 gigs of RAM. Incidentally, the single-core and multi-core scores have improved from the last time the device check through Geekbench, with a respective 640/1884 compared with the previous 599/1790. The original Samsung Galaxy Grand Prime launched two years ago with a 540 x 960 5-inch display, 8 and 5-megapixel camera combo on the back and front respectively, and Qualcomm's Snapdragon 410 with 1.5 GB RAM. Aside from a change in processor, it doesn't appear that Samsung is going to make too many enhancements with the 2016 model. Still, we'll keep an eye out for its official arrival, so stay tuned. This phone is weak even by 2014 standards, not to mention 2016, why the hell is samsung even making such phones? Just a waste of money. And people say Apple has a great profit margin, I bet this also has a 50-60% profit margin. FCC is kinda like a sieve when it comes to keeping information locked down.